Vice President of the Turkish Presidency of Religious Affairs, Hasan Yilmaz, declared during his visit to Gaza the start of the Turkish campaign to rebuild and restore the mosques that were destroyed during Israel’s recent aggression. 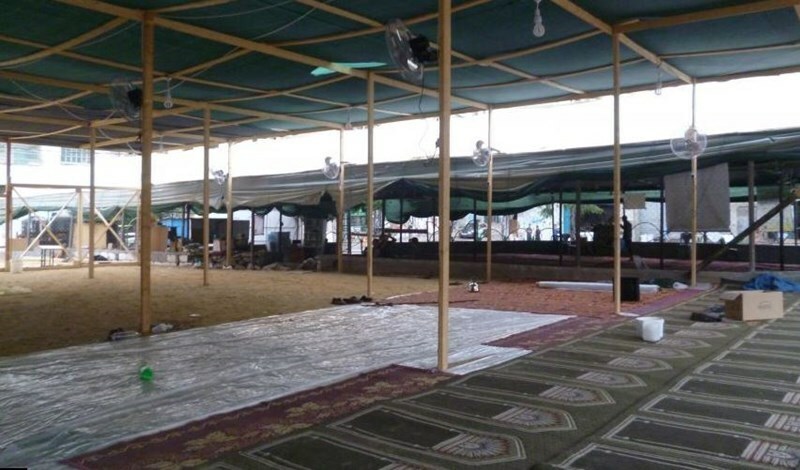 During the opening of al-Safa Mosque in Bureij refugee camp in the central of Gaza, Yilmaz said that his visit came with the aim of laying the foundation stone of the Turkish project of Gaza mosques reconstruction that was earlier declared during the Turkish Religious Affairs Minister Muhammad Kormaz’s visit to the Strip a month ago. "We are proud of the Palestinian heroic resistance and strong steadfastness in front of the Israeli enemy", he said during the opening ceremony. Yilmaz stressed the importance and sacredness of occupied Jerusalem and al-Aqsa Mosque for the Islamic nation. He also pointed to the Turkish people’s strong support for the Palestinian cause and people. The Turkish Ministry for Religious Affairs works at developing Muslim religious tourism to occupied Jerusalem through organizing trips for Turkish pilgrims to the occupied city before heading to Makkah. For his part, Dr. Ahmed Baher, first deputy speaker of the Palestinian Legislative Council, expressed his gratitude to the Turkish authorities and people for their political and financial support for the Palestinian people. He also thanked the Turkish President Recep Tayyip Erdogan for his positive position in support of the ongoing Jerusalem Intifada. The first phase of the Turkish campaign includes the reconstruction of nine demolished mosques with a coast of $ 4.7 million. During the three Israeli aggressions on Gaza, 110 mosques were totally destroyed while 436 others were partially demolished. 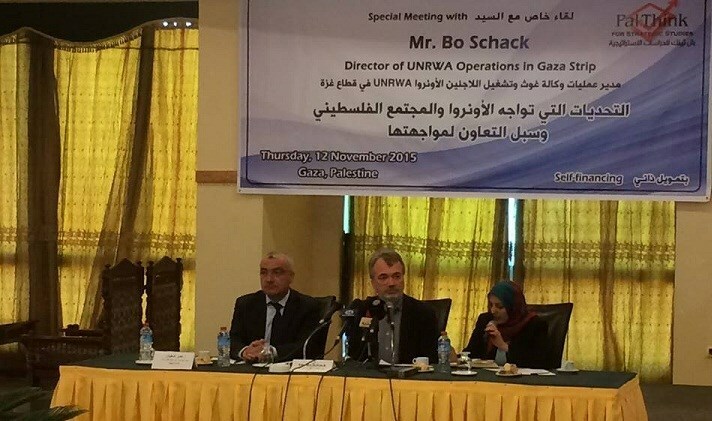 Head of UNRWA operations in Gaza Bo Schack stressed, during a workshop organized by Pal Think Organization on Thursday, that the UN agency is currently working on Gaza reconstruction file. Several local businessmen, national figures, and journalists have attended the workshop to discuss Gaza reconstruction operation. Since Israeli aggression on Gaza, UNRWA has distributed aids for more than 70,000 badly affected families, he underlined. We are in real need for financial support especially from Qatar, Saudi Arabia, and the U.S. There are still 7,000 to 8,000 totally destroyed homes in Gaza; however, the available funding would only be enough for rebuilding 2,000 destroyed homes, the UN official explained. Bo Schack pointed out that efforts are still continued in cooperation with several parties for Gaza reconstruction. Israeli Municipality of Jerusalem refused a map sketch prepared by Palestinian inhabitants of al-Issawiya town in Occupied Jerusalem after being deprived of construction permits for years because of the unavailability of such a sketch. Iroshalim Hebrew newspaper disclosed that the municipality’s refusal of the sketch will lead to hindering the issuance of building permits so that Palestinians can construct over their own lands. The municipality justified the refusal by lack of funding and waiting for the coming budget. Meanwhile, it is working on establishing a public park on the expense of Palestinians’ lands in al-Issawiya and al-Tour towns. The Israeli environment authority, however, said there is no real value of establishing a park in that area. The Israeli appeal committee refused the municipality’s decision to establish the park, but the latter issued a new decision to garden the area. The gardening decision stipulates for the confiscation of Palestinians’ lands for five years for building a temporary park over the lands. 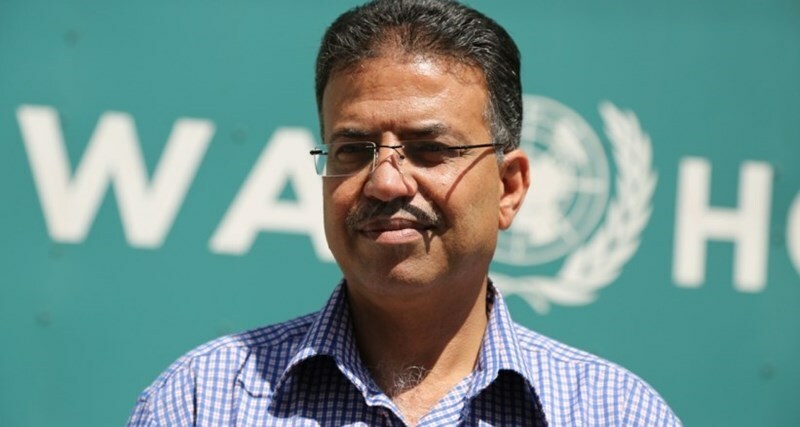 UNRWA’s media consultant Adnan Abu Hasna said UNRWA has got the funding of the construction of 1150 of the houses completely damaged in 2014 summer’s Israeli aggression on the blockaded enclave. The house list will be released within the next weeks. Meanwhile, 165 houses are being reconstructed. Abu Hasna said, in a statement on Tuesday, UNRWA renovated over 66,000 houses of the partially destroyed. While, 9000 homes are under construction and 56,000 others await being funded. He pointed out that 430 of the greatly damaged houses have been accomplished whereas 2000 houses are being renovated and 6500 homes require funding. Abu Hasna underlined that great efforts have been exerted in this regard, but the reconstruction process goes very slowly and suffers severe lack of funding. It got only 30% out of $724 million which was determined at the reconstruction conference in Cairo. UN Special Coordinator for the settlement process in the Middle East Nikola Mladenov on Thursday declared that a UN meeting is to be held in the near future to discuss Gaza power and water crisis and reconstruction process. 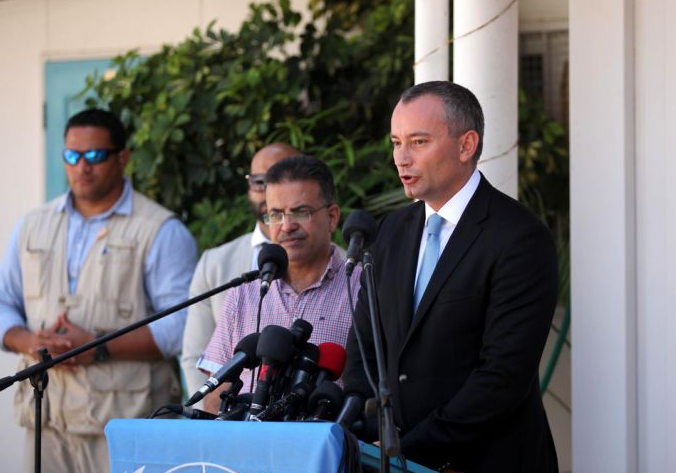 In a press conference held shortly after reaching Gaza Strip, Mladenov said that a meeting is scheduled to be held on the sidelines of the UN General Assembly session by the end of this month. The meeting is expected to bring further progress in settling Gaza crisis, he said. 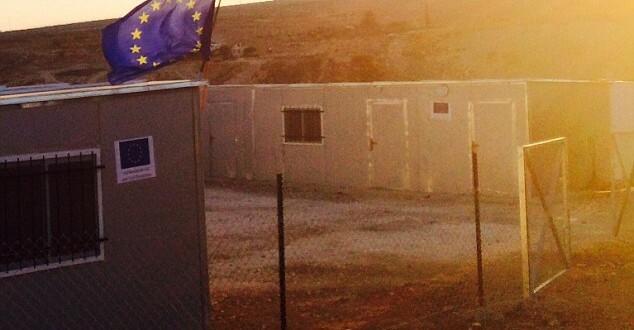 Early Thursday, Mladenov arrived to the blockaded enclave through the Israeli-controlled Erez crossing. It is the second visit paid by Mladenov to Gaza since he was appointed as the UN Special Coordinator for the settlement process in the Middle East last March. His few-hour visit aims at discussing Gaza reconstruction process and finding solutions for the economic crisis faced by 1.8 million people in the besieged Strip. "It is very important to achieve a better life for the people of Gaza," Miladenov said. Meanwhile, he gave a rare upbeat assessment in the Gaza Strip, saying that reconstruction from last year's war on Gaza is speeding up. The reconstruction of hundreds of houses started last month with the help of Qatar, which has donated millions of dollars to rebuild 1,000 housing units, he pointed out. "I'm very happy to be able to report today that the reconstruction effort has visibly accelerated within the last two months," said Mladenov. However, he noted that Gaza reconstruction process is facing a major shortfall in humanitarian funding. "We are very far from reaching the goal of restoring normal life to Gaza," Miladenov said. "We will work with both the Israeli and Palestinian parties to solve Gaza crisis," he vowed. In this regard, he called on the Palestinian Authority to take full control and responsibility in Gaza in order to achieve its faster reconstruction. More than 2,200 Palestinians, including 500 children, were killed during the Israeli 51-day aggression on Gaza last summer, while thousands of homes, schools, and hospitals were destroyed. Palestinian president Mahmoud Abbas is constructing a $13 million palace in the West Bank, despite the country being crippled by financial woes, Newsweek magazine reported Wednesday. 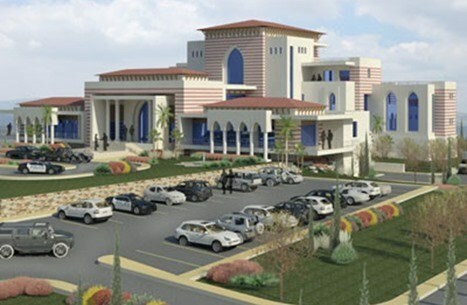 The project, titled the Presidential Guest Palace in Surda, Ramallah, is listed as an ongoing project on the official website of the Palestinian Economic Council for Development & Reconstruction (PECDAR). It is due to take two years to complete, though the project's start date is not clear from the website. The complex will include a 4,700-square-meter guest palace and two helipads, as well as a 4,000-square-meter administrative building. It will be constructed over a total land area of 27,000 square meters. PECDAR said on the website that the project will be financed by the Palestinian Ministry of Finance. The objectives of PECDAR, as listed on its website, include "coordinating the flow of international assistance for the benefit of the Palestinian people", and "identifying investment projects and other activities to be financed by the donor countries." It is accountable to a Board of Trustees, headed up by Abbas. Most of the other ongoing projects listed on PECDAR's website are being funded by foreign donors, including a $4.5 million drug warehouse in Nablus being funded by the French government and a $7.2 million judicial court complex in Hebron (al-Khalil), funded by the Government of Canada. PECDAR was not immediately available to comment on the purpose of the palace and how it would benefit the Palestinian people. Palestine has been beset by financial crises throughout 2015. The Palestinian government adopted an emergency budget in March after donor countries failed to transfer $5.4 billion in aid that had been pledged in October, following the 2014 Israeli offensive on Gaza. Palestine was also hit by Israel's decision to freeze monthly Palestinian tax revenues of $127 million in protest of Palestine's decision to apply for membership of the International Criminal Court and sue Israel for war crimes against Palestinian civilians. Israeli news site Arutz Sheva, which reported the project, said the fact that the palace was considered a national priority "throws into further relief the massive corruption in the PA." However, the cost of the palace is dwarfed by that being spent on the construction of a new combined residence and office in Jerusalem for the Israeli prime minister, Benjamin Netanyahu. The project, approved by the Israeli government in May 2014, is estimated to cost $188 million. 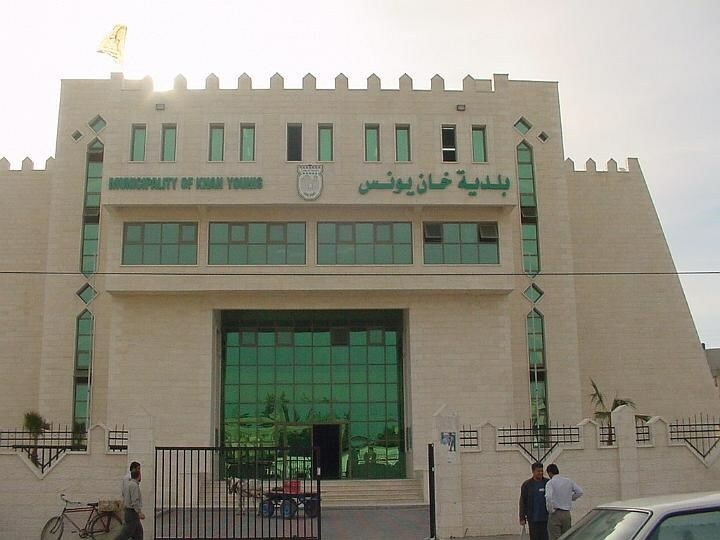 The municipal authority of Khan Younis town in Gaza has finished carrying out a number of important infrastructure and road development projects funded by donor parties at an estimated cost of one million dollars. In a press release on Monday, head of the projects department at the authority Hisham al-Abadeleh stated that the municipal authority of Khan Younis was able, despite the blockade imposed on Gaza, to carry out several projects in different areas of the town during the first half of the current year. The projects included the construction and rehabilitation of roads and streets as well as public facilities, according to the municipal official. The Israeli occupation bulldozers at dawn Tuesday knocked down two Palestinian homes under construction in Jerusalem’s town of Silwan, to the south of holy al-Aqsa Mosque, allegedly due to unlicensed construction. A PIC journalist quoted local sources as stating that the two demolished homes, owned by the brothers Mohamed and Khaled Sa’id al-Abassi, were reduced to rubble without prior notifications. Heavily-armed Israeli officers reportedly escorted the bulldozers all along the demolition process and cordoned off the area for long hours. 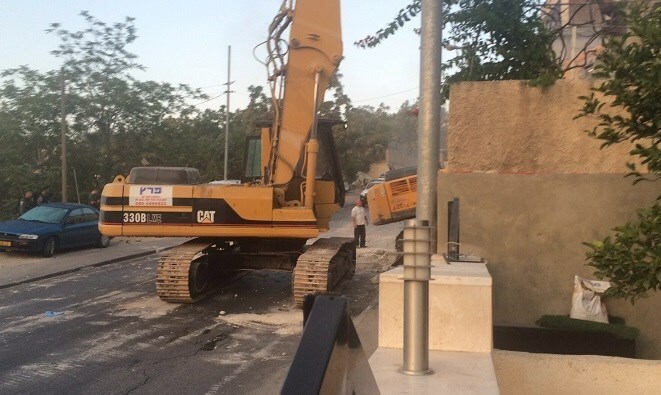 Israeli Occupation Forces (IOF) on Wednesday morning demolished a building under construction in the Wadi al-Joz neighborhood in occupied Jerusalem. According to QPress, large numbers of Israeli police and border forces surrounded the building and closed the main street leading to it before starting the demolition process. The building with a building area of 500 square meters belongs to the Tawtah and al-Tawatnji families. Construction works on the building began nine months ago. 50 families were planning to live there, the sources said. Ma’ariv Israeli newspaper on Thursday said that the Israeli ministry of foreign affairs has warned the European Union from carrying on with funding building projects in the “C” West Bank, areas. The C areas, due to the 1993 Oslo accords, make up about 75% of the West Bank. Theoretically, they fall under Palestinian civil administration, and Israeli military control. Ma’ariv said that the EU responded by saying that Israel was violating the international law by preventing Palestinians from building in the C areas. The recently appointed deputy director-general for Western Europe in the Foreign Ministry, Aviv Shir-On said that this subject is brought up in almost every conversation with the EU. He said that any “illegal building procedure will not be accepted,” adding that the EU knows the Israeli stand from the procedure. Shir-On concluded by saying that the Israeli occupation authorities told the EU that the built structures might be destroyed, and that the EU receive a demolition threat before it takes place. Israeli Occupation Forces (IOF) razed under-construction houses, leveled agricultural lands, and confiscated a caravan in east of Bethlehem. 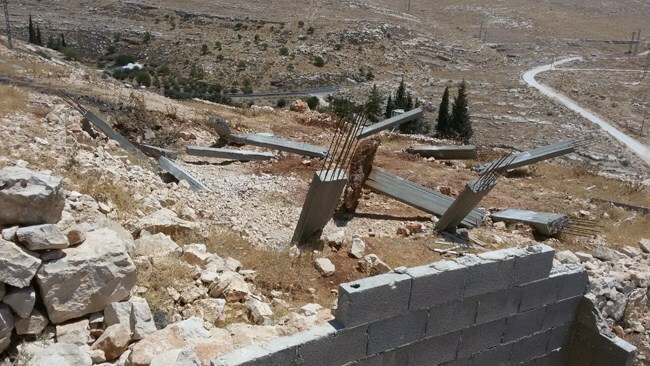 The PIC reporter revealed that Israeli military bulldozers escorted by IOF soldiers stormed Taqua town in east of the city and demolished the foundations of a Palestinian house under construction. The forces notified the owner of the demolition order a few months ago under the claim of building in an Israeli-controlled area, the reporter pointed out. The Israeli bulldozers also razed an under-construction house belonging to a Palestinian family in Janata town to the east of Bethlehem, claiming lack of construction permit in the Israeli-controlled Region C.
In a similar context, the Israeli forces leveled an agricultural land belonging to a Palestinian man from Zaatarah town to the east of Bethlehem as well. 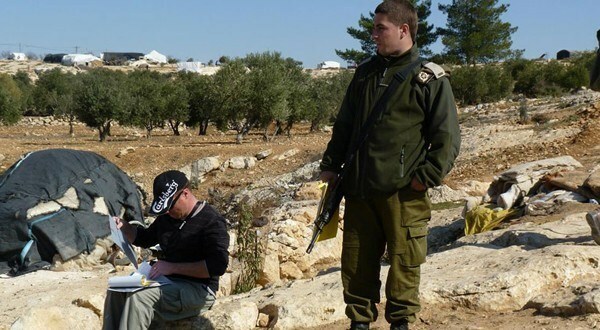 The forces also asked the man to pay for leveling works conducted by the IOF bulldozers. The same forces confiscated a caravan belonging to the same person after completing the leveling of his land. An Israeli Knesset subcommittee on Tuesday said that Palestinian efforts to build in Area C were aimed at creating "facts on the ground" to prevent the expansion of Jewish communities, a Knesset press release said. MK Mordhay Yogev, who heads an Israeli foreign affairs and defense subcommittee for the occupied West Bank, said that Palestinian building efforts were "aimed at creating facts on the ground and preventing the expansion of Jewish communities such as Ma'ale Adumim." Yogev said that while "illegal construction exists also in Jewish communities in Judea and Samaria, it is on a much smaller scale and takes place within existing communities," referring to illegal Jewish-only settlements in the occupied West Bank. Yogez is a member of the right-wing Jewish Home party, headed by Nafatali Bennett, who has in the past called for Israel to annex Area C.
Area C makes up 61 percent of the occupied West Bank and holds most of its natural resources. The 1993 Oslo Accord places the area under full military and administrative control by Israel with the intention of eventually being transferred to the Palestinian Authority. However, the Israeli Civil Administration responsible for the area has largely used its resources to expand and develop illegal Israeli settlements, and has confiscated Palestinian land and demolished structures toward that end. 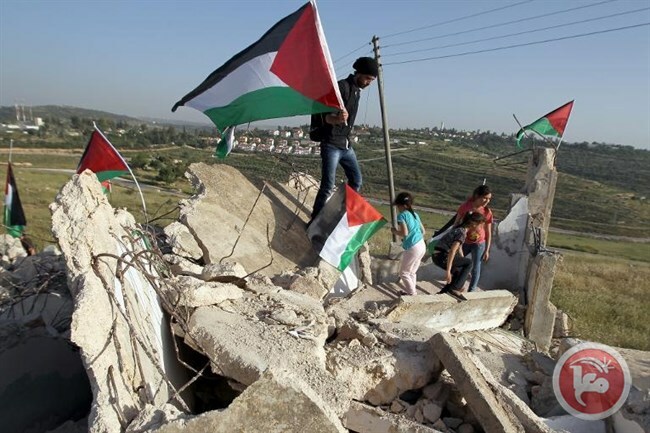 According to the Israeli Committee Against House Demolitions, Israel has demolished at least 27,000 Palestinian homes and structures since occupying the West Bank in 1967. "Facts on the ground" is a term regularly used to refer to the presence of more than 500,000 Israeli settlers living across the occupied West Bank and East Jerusalem, who have made the possibility of a two-state solution increasingly difficult. Last month, the EU Council warned that: "The viability of the two state solution is constantly being eroded by new facts on the ground." The EU is among many international bodies to have blasted Israeli policy in Area C. EU representative John Gatt-Rutter said in March that Area C is an integral part of the occupied Palestinian territory, comprised of crucial natural resources and land for a viable Palestinian State." Without this area, the two state solution -- that we have invested in for years -- will be impossible," he said. The Israeli occupation army on Sunday issued an order halting work on a water project funded by the European Union (EU) in Yatta town, south of al-Khalil city, and photographed a number of wells and structures in other nearby areas. Anti-settlement activist Rateb al-Jabour told the Palestinian Information Center (PIC) that Israeli soldiers stormed Khellet al-Mayyeh village, south of Yatta, and handed its municipal chief a halt order against the construction of two EU-funded water tanks. As usual, the Israeli army justified its measure by claiming that the project was unlicensed. Jabour also said that soldiers photographed a number of water wells belonging to Palestinian citizens in the western area of Yatta as well as sheds, tents, and other wells in Umm al-Khair village, east of Yatta. The activist condemned such Israeli measures against the Palestinian villagers in Yatta as aimed at forcing them to leave their native areas for the sake of settlement expansion activities.